In June 2015, the EPA granted a licence (W0272-01) to Roadstone Limited for the filling of Milverton Quarry. All documentation relating to the Waste Licence Application is available at http://www.epa.ie/terminalfour/waste/waste-view.jsp?regno=W0272-01#.VQFCp_msWWz, and the decision document is at http://www.epa.ie/licences/lic_eDMS/090151b28053e84b.pdf. Two million tonnes of material in 20-tonne loads means 100,000 truck movements into the quarry and 100,000 movements out: 200,000 movements along local roads in total to backfill the quarry. The hours of operation permitted under the licence are 7 a.m. to 6 p.m from Monday to Saturday. Roadstone estimates that they will bring in an average of 250,000 tonnes per annum, but the licence does allow up to 400,000 tonnes per annum to be trucked (if construction market conditions warrant it). This upper limit of 400,000 tonnes means 20,000 truck trips to the quarry and 20,000 return trips per year (assuming every truck is full). That is 40,000 trips for the year! If the trucks are spread evenly over fifty weeks per year, six days per week, and 11 hours per day, that is 400 trips each way per week, about 65 trips each way per day or six chances every hour of either being stuck behind a truck or, for a cyclist or pedestrian, being passed by a truck. And there’ll be just as many trucks going the other way from you. However, this average figure is misleading because there will be peaks and troughs in the pattern of truck movements. The Environmental Impact Statement (EIS) [http://www.epa.ie/licences/lic_eDMS/090151b2804ee028.pdf] that Roadstone submitted as part of the Waste Licence application looked at traffic movements logged when the quarry was operating. Roadstone found that the average figure increased by a factor of 3.3 in peak periods, meaning there could be more than 20 trucks each way in an hour. 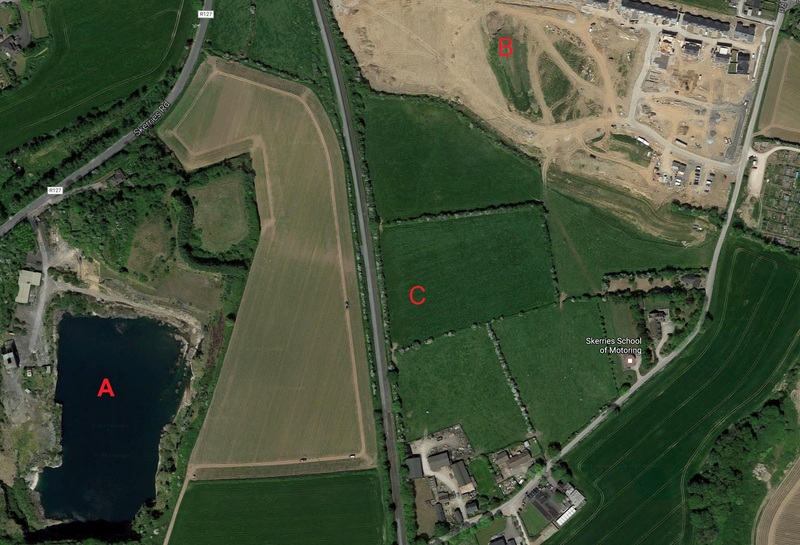 Satellite image showing the quarry to be filled (A), the new Links housing estate under construction (B) with the railway line running between them (C). The trucks are not required to come and go only on the R127 from Blakes Cross. Some number of the trucks could come from the direction of Balbriggan (or from Rush) and pass through Skerries to reach the quarry. What has Skerries Community Association been doing to highlight concerns? In 2015, during the consultation phase for the license application, Skerries Community Association, along with concerned individuals, objected on several grounds including traffic impacts. See http://www.epa.ie/licences/lic_eDMS/090151b2805229a2.pdf. Responding to our concerns about traffic levels and safety, the EPA Technical Committee, which considered objections to the waste licence application, stated: “The Technical Committee acknowledges concerns raised in respect of the traffic volume. However, issues related to traffic that is outside the facility boundary lie within the remit of the Planning Authority.” [http://www.epa.ie/licences/lic_eDMS/090151b28053e84f.pdf, page 10] Fingal County Council is the Planning Authority. While the An Bord Pleanála determination has clarified the position legally, it appears that there was no requirement under planning legislation for Fingal County Council to look at traffic issues around the Milverton Quarry site in the context of the proposed re-opening. When is the seven-year backfilling process scheduled to start? The Planning & Strategic Infrastructure Department has no information on and is unaware of when the operator, Roadstone Dublin Ltd, intends to commence the backfilling process at the subject site. Have any conditions been imposed to minimise the impact of HGV movements along the R127 and adjacent roads at peak times (i.e. commuting weekday traffic and visiting weekend traffic)? No conditions have been imposed to limit the movements or restrict the times at which HGV traffic can access the R127. This type of restriction can carry with it adverse impacts which the Council is anxious to avoid. However, Condition 10 (i) requires the operator to monitor the condition of the road pavement of haul routes including the R127 to minimise the impact of HGV movements on the condition of the road pavement. Given that construction related vehicles are over-represented in serious road traffic accidents, are any measures being planned to ensure the safety of cyclists, pedestrians and other vulnerable road users while the back-filling is in progress? No measures were deemed warranted and it would not be feasible to implement measures. All vehicles using the public road network are subject to the Road Traffic regulations. Have any arrangements been agreed in relation to weekend sporting events (e.g motor cycle racing) along the R127 between Skerries and Lusk? 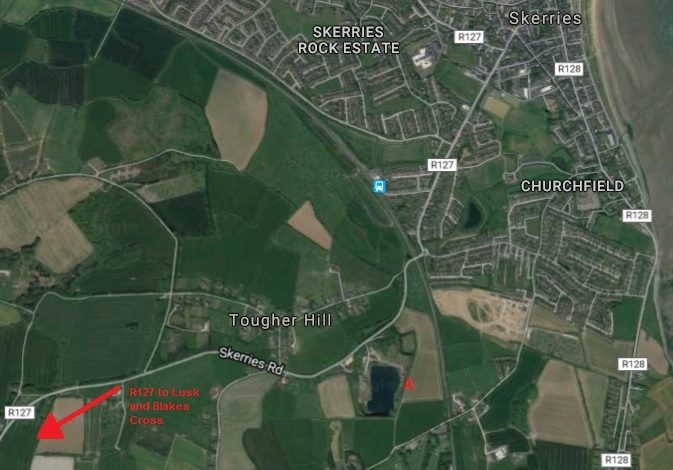 Arrangements in relation to weekend sporting events along the R127 between Skerries and Lusk would be the responsibility of event organiser and subject to an event licence and associated traffic management plans and road closures. These matters can be addressed in the context of a temporary road closure application. If Substitute Consent (see Appendix II) was not required under planning legislation, as determined by An Bord Pleanála, were the traffic issues outside of the site evaluated, and if so how? Traffic issues outside of the site were evaluated as part of the Planning Application Q/05/003, were not deemed to be significant and conditioned accordingly under condition 10. In the context of the projected seven-year life of this project was any consideration given to alternative means of getting the fill material to the site e,g by rail, given the proximity to the site of the rail line? Consideration of getting the fill material to the site by rail would be a matter for the applicant. It would appear that such a proposal would not be feasible due to land ownership issues and the nature of the material being transported to the site would come from various approved sources which are unlikely to avail of rail facilities. 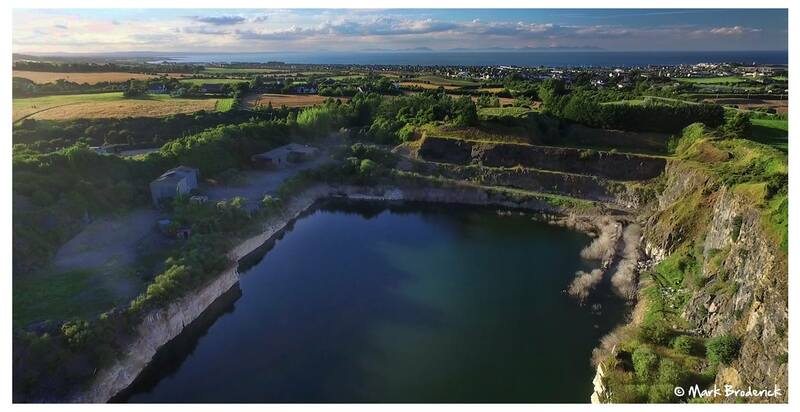 The Skerries Community Association believes that the resumption of extraction and filling operations at the quarry raises concerns in relation to HGV traffic levels and road safety that have not been satisfactorily addressed. Both Fingal County Council and Roadstone have said recently that they are willing to meet community representatives to discuss any concerns. Should the SCA convene a public meeting where SCA members and, indeed, all Skerries residents would be able to share their views and to look for meaningful answers and action from Fingal County Council and Roadstone? Give us your opinion at traffic@skerriesca.com. Anyone who is over 18 and living in Skerries can join the SCA. The easiest way to join is by filling in our online membership form. This entry was posted in Updates from Fingal County Council by Tony Graham. Bookmark the permalink.